Minister of Textiles and Information & Broadcasting, Smt. Smriti Zubin Irani has said that India is a land of festivals, celebrations, dynamic youth and stories, where in stories were told in over 1600 dialects. Minister said this while addressing the opening ceremony of 48th international Film Festival of India in Goa. Elaborating further, Smt Smriti Zubin Irani said that the endeavor of Government of India through International Film Festival of India is to invite film makers from all over the world to the land of stories. Speaking on the role of IFFI, Minister said that the festival will help the film lovers to meet the biggest and brightest names of Indian film industry. Chief Minister of Goa, Shri Manohar Parikkar in his address welcomed all the delegates to IFFI 2017 and said that Goa will be ready in 2019 to host the 50th edition of IFFI in a magnificent way. Shri. Parikkar added that Goa has developed a good film culture over the last few years and the state government would continue its work towards further developing the film industry in Goa. Earlier, Indian film star Shri. 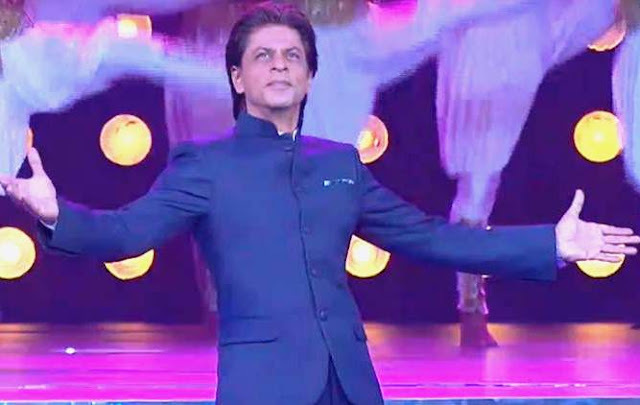 Shahrukh Khan while welcoming all film makers and delegates to IFFI 2017 said that films are about loving, about an idea transformed into reality by hundreds of people working together. He further added that story tellers and story listeners are like a family and stories have the power to bind each and every one together. The opening ceremony of IFFI 2017 was anchored by Raj Kumar Rao and Radhika Apte and eminent Indian film personalities such as A.R Rahman, Sridevi, Nana Patekar and Shahid Kapoor graced the event. The inaugural ceremony also witnessed some mesmerizing audio visual performances like ‘Drums of India’, a musical treat with drums from all across the country and ‘Utsav’, a visual spectacle showcasing diversity of Indian culture. The 48th IFFI will showcase the best of recent International cinema, along with special sections such as Retrospectives, BRICS Award-Winning films, Homages and an Indian Panorama Section featuring the best of Indian Cinema produced in the past year, with the aim of providing a platform for young creative minds to interact, view and learn. IFFI 2017 will showcase 195 films from over 82 countries of which there will be 10 World Premieres, 10 Asian and International premieres and over 64 Indian premieres. The International Competition section of IFFI 2017 will have 15 films competing for the Golden and Silver Peacock awards. The International Competition jury is headed by renowned filmmaker Muzaffar Ali and other jury members include Maxine Williamson from Australia, Actor-Director Tzahi Grad from Israel, Russian Cinematographer Vladislav Opelyants, Director and Production Designer Roger Christian from the United Kingdom. IFFI 2017 will also witness Indo-centric projects with a strong international connect at the Opening as well as the Closing films. Iranian master Majid Majidi’s first film made in India, “Beyond the Clouds” and Pablo Cesar’s Indo-Argentine co-production “Thinking of Him”, centered on an episode in the life of Gurudev Rabindranath Tagore will be screened as opening and closing films respectively. As the first of its kind in the country, IFFI 2017 has a specially curated section of James Bond films. The special section with 9 iconic James Bond films will showcase the various leading actors who have essayed the character of James Bond from 1962 to 2012. Further, IFFI 2017 will have a special focus on Canada curated by the Toronto International Film Festival. The Homage presentations at the 48th IFFI will include tributes to the late Actors Om Puri, Vinod Khanna, Tom Alter, Reema Lagoo, Jayalalitha, Directors Abdul Majid, Kundan Shah, Dasari Narayana Rao and Cinematographer Ramananda Sengupta. IFFI 2017 will also host a special curated selection of 7 award winning films from BRICS region as part of the BRICS Film package. The Accessible India, Accessible Cinema section at IFFI 2017 will showcase 2 audio-described cinematic works for the visually impaired thereby continuing the support for Government of India ‘Accessible India Campaign’. Indian Panorama 2017 will further screen both Feature & Non-Feature films in Goa at 48th International Film Festival of India, 2017. The opening film of the feature film section of Indian Panaroma will be Pihu, directed by Vinod Kapri and the opening film of the non-feature film section of Indian Panorama is Pushkar Puran which has been directed by Kamal Swaroop. This will showcase the new Indian cinema from across the country.